Cliff Pace, 2013 Bassmaster Classic, Day 3 Weigh-In with 2 of his winning bass from Grand Lake Oklahoma February 24. Photo Credit: Seigo Saito/B.A.S.S. 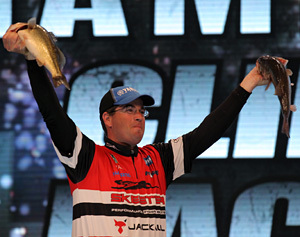 Only three states sent more pros to the 2013 Bassmaster Classic than Michigan. But despite the state’s strong representation - three qualifiers, including four time winner Kevin VanDam - Michigan pros were unable to match the consistency of Mississippi’s lone representative, Cliff Pace. Pace showed great confidence in a jerkbait bite he knew wouldn’t really kick in until mid-day. Anchored by his late-day, jerkbait heroics, he surged to a seemingly insurmountable seven pound lead going into the final day on the strength of 21 pound limit catches on days one and two. However, when he most needed the jerkbait bite for a late surge on day three, he discovered that a change in wind direction had left the water in his primary spot as smooth as glass, neutralizing the effectiveness of the presentation. With only a couple hours left in the tournament and just two fish in his livewell, Pace made a critical adjustment, ditching the jerkbait in favor of a jig / plastic combo and landed two late fish to preserve a narrower than expected win. Calming water, bright skies and increased spectator boat traffic made for tough conditions on the second day of fishing. Most anglers scrambled to find new patterns after their successful jerkbait patterns of the previous day seemed to evaporate with the dissipating wind. Lucky cookies weren't enough this time for KVD at the 2013 Grand Lake Bassmaster Classic though he still managed an 8th place finish. Photo Credit: Seigo Saito/B.A.S.S. In fourth place and less than two pounds behind day one leaders Pace and Mike Iaconelli, legendary Michigan pro Kevin VanDam, fishing in his 23rd straight Classic, looked to be in great position for his fifth Classic win. But KVD was unable to capitalize on his strong day one performance, failing to weigh limits on days two and three and finishing in eighth place. “As good as the fishing had been, if you’d have told me I’d fail to bring in a limit, I wouldn’t have believed you”, KVD told the crowd gathered at the Tulsa BOK Center after day two. 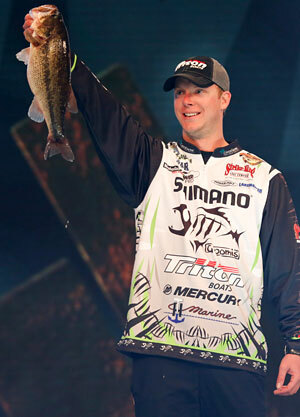 Cold weather gave Jonathon VanDam equipment problems though he hales from Michigan but he still managed a respectable 23rd place in his first Bassmaster Classic. Photo Credit: Gary Tramontina/B.A.S.S. Jonathan VanDam, fishing in his first Classic, also found the fishing tougher on day two. In 13th place after day one, JVD also failed to weigh a limit on days two and three and finished 23rd. Execution issues played a significant role in JVD’s disappointing day two finish. 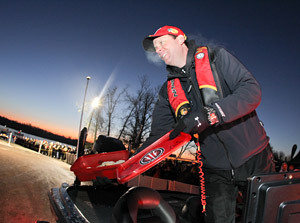 “I was fishing around boulders most of the day and my rod guides were icing up during the first few hours of the tournament”, said JVD, referring to factors that contributed to a couple of break offs - fish that might have kept him within reach of first place. Newaygo, Michigan’s Nate Wellman, also fishing in his first Classic, narrowly missed making the final day three cut of the top 25 anglers but finished in a respectable 30th place. Wellman suffered through every pro’s worst nightmare on day one when he lost a fish he estimated at six or seven pounds seconds before he could land it. John Crews of Salem, Virginia was one pro who used the tough day two conditions to his advantage. Crews recognized the need to shift to stealth tactics and slower presentations early on and credited one of his sponsor’s products, Michigan-based Troll Perfect, with allowing him to get closer to spookier fish by reducing the noise made by his trolling motor. Only one other time in Classic history has Michigan produced this many Classic qualifiers; in 2000, when Art Ferguson, Kim Stricker, Phillip Jones and Kevin VanDam all qualified. With the addition of Holt, Michigan’s Chad Pipkens, who joins KVD, JVD and Wellman on the Elite Series circuit this year, it’s conceivable that Michigan could send four or more anglers to the 2014 Classic.